I joined Facebook sometime in the fall of 2006 when it first opened its doors to everyone. At the time, it was an easy way to stay in touch with friends from high school with few advertisements, relatively little addictiveness, and no impact on presidential elections. Since then, it’s morphed from being a place to check in with friends to a central hub for all Internet activity. You go there for news, entertainment, messaging, events, organizations, and anytime you’re momentarily bored. That switch hasn’t come without its costs. It’s confused us into imagining people are thinking about us all the time when they aren’t. We have to filter through fake news and misleading stories. We’ve gone from treating the Internet as a repository of information to treating it like a cocaine pellet dispenser. At one point, Facebook was fun and exciting to use, but for many, it’s now somewhere between a compelled membership and a guilty addiction. You use it just so that you have messenger, or just because everyone else does, or you just end up going there when you have no idea what else to do with your time. And it’s not a trivial amount of time. The average user spends 50 minutes a day on Facebook’s apps (mostly Facebook, Instagram, and Messenger), which means you’re spending almost 1/16 of your waking hours in their ecosystem. If you’re happy with that, that’s fine, but many people recognize they’re spending more time on it than they should, but aren’t entirely sure how to reduce it, especially since the obvious option, deleting your Facebook account, takes Messenger with it. No news feed, no trends, nothing to pull me in beside notifications. I never get sucked down the endlessly scrolling rabbit hole since I can’t even see it. And since all of the most distracting elements are hidden, I don’t need to exert willpower avoiding visiting the site, since I never spend more than a few seconds there anyway. 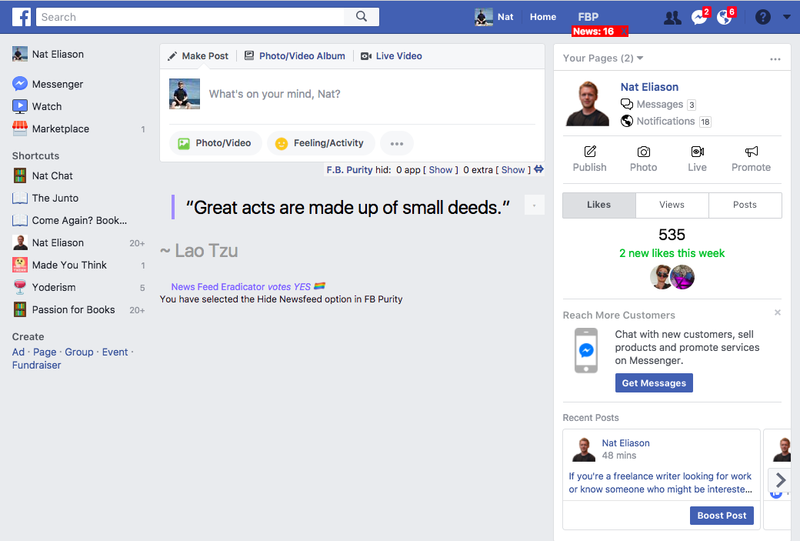 To do it, you’ll need two tools: FBPurity, and News Feed Eradicator. News Feed Eradicator makes the most obvious change: getting rid of the news feed. 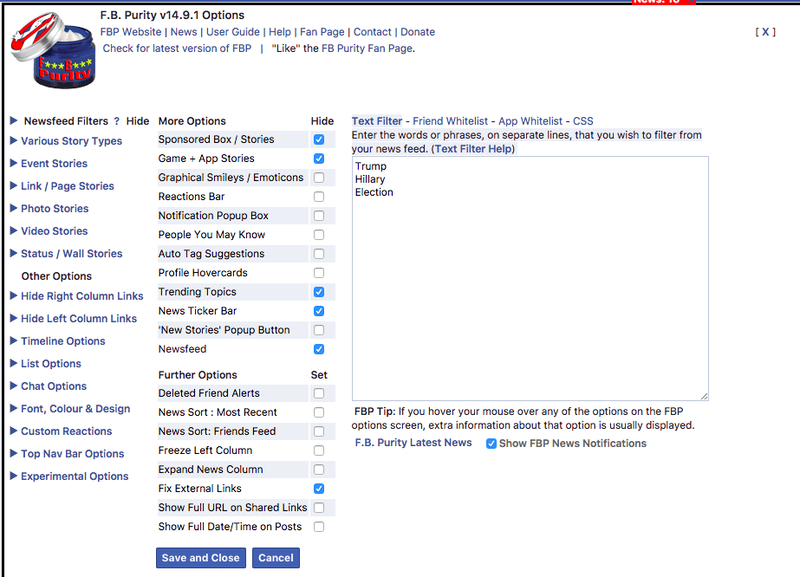 Once you install it you’ll immediately be saved from the biggest distraction on the site. I have it blocking sponsored stories, trending topics, the news ticker, and then in the “Right Column Links” you can turn off ads, games, and other annoyances. With both set up, you’ll be free from every distracting time-sucking element of Facebook and be able to drop in, respond to notifications, and leave. You can’t block these features in the Facebook mobile app, but you’ll find it’s easy to delete the app and not miss it once you get used to not having the news feed in your life. And since you didn’t have to delete your account to escape the addiction of Facebook, you can still use Messenger to talk to people. All the freedom of deleting your Facebook account with none of the downsides. Yes, You Should Delete Facebook. Here's Why.